NGC 3115. Image: Canada-France-Hawaii Telescope. Two different galaxies are known as the Spindle Galaxy. One is NGC 3115, also known as Caldwell 53, a lenticular galaxy (type S0) in the constellation Sextans. It was discovered in 1787 by William Herschel. NGC 3115 has an apparent magnitude 9.1 and an angular size of 8.3 by 3.2 arc-minutes, and lies at coordinates RA 10h 05.2m, Dec. -07° 43'. NGC 3115 was the fourth galaxy in which a supermassive black hole was found (Kormendy & Richstone 1992, ApJ, 393, 559). It is well suited to the black hole search: at a distance of only 32 million light-years (9.7 megaparsecs), it is close enough that the effects of a black hole on nearby stars are easily seen, and it is transparent (no dust) and made of old stars so that the measurements are straighforward. Also, it contains an edge-on nuclear disk of stars. This is important because it means that the dynamics are dominated by rotation. As a result, the central mass can be measured with fewer uncertainties than normal. In fact, the black hole in NGC 3115 was one of the easiest to find, because it is unusually massive compared to the rest of the galaxy. Rapid rotation and large random velocities of the stars near the center imply that NGC 3115 contains a black hole about 1 billion times as massive as our Sun. The other galaxy called the Spindle Galaxy is NGC 5866 in the constellation Draco. NGC 5866 is also lenticular galaxy (type S0_3) seen almost edge-on. It has an apparent magnitude of 9.9 and an angular size of 5.2 × 2.3 arc-minutes, and lies about 40 million light-years away at coordinates RA 15h 06.5m, Dec. 55° 45'. NGC 5866 is part of a group of galaxies (the NGC 5866 group), which also contains NGC 5907 and 5879, as well as many fainter galaxies. From the movements of the galaxies in the group, NGC 5866's mass has been estimated at 1 trillion solar masses. 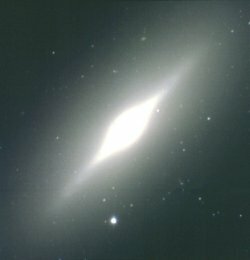 Astronomers suspect that NGC 5866 may be M102, one of the last disputed Messier objects, though this is still a matter of debate.